In order to stay ahead of the curve in the online world, it’s crucial to learn about the latest web trends that are developing. This is exceptionally true for businesses- to adequately compete with other companies in your industry, you need to be informed of the newest trends that are being established online. 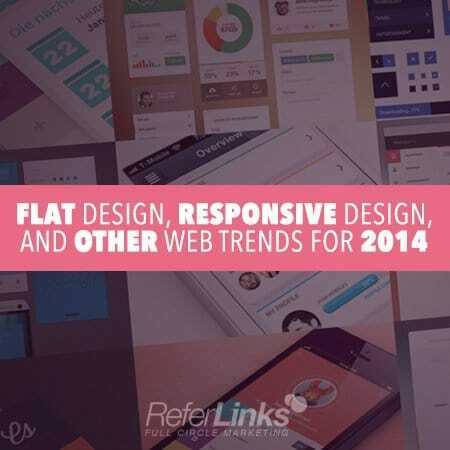 At this time, we’re going to look at flat design, responsive design, and other web trends for 2014. Flat Design: Apple’s iOS7 is a sterling example of flat design. Simple yet appealing, many websites are following this intriguing design layout popularized by Apple, one of the most influential leaders when it comes to setting trends. With smooth colours and added simplicity, flat design is a trend that will continue to gain traction throughout 2014. Responsive Design: With the influx of mobile devices being used by web browsers across the globe, the significance of responsive design should not be ignored. When implemented, responsive web design allows sites to be much more mobile friendly, which is integral in 2014. There are many mobile-only users nowadays who no longer own desktop computers, and responsive design helps cater to those that prefer to use their smart phones and tablets to browse the web. Quality Content: In 2014, it’s more important than ever to create engaging content that can captivate an online audience. Distracting elements are being left by the wayside, while crafting quality content is a paramount focus. Quality content is needed to keep web browsers revisiting sites, and is integral to keep these sites ranked well in search engines. More Video Content: With so much information available on the World Wide Web, not everyone has the time to seek and read it all. Video content is a great way to get attention from online browsers- after all, they get instant gratification from watching a brief video clip. Now that video content is becoming more affordable to produce and easier to share on social media, many web sites are jumping on the video bandwagon. These are just some of the web trends that are currently making an impact. It will certainly be interesting to see the other trends that emerge throughout the rest of the year! This entry was posted in Website and tagged Design Trends 2014,Flat Design 2014,Marketing,Responsive Design 2014,Web Marketing,Web Trends 2014,Website Trends 2014 on August 5, 2014 by ReferLinks Online Marketing.